The conversations with like-minded people are always so easy and enjoyable, probably because we share similar interests and experiences. 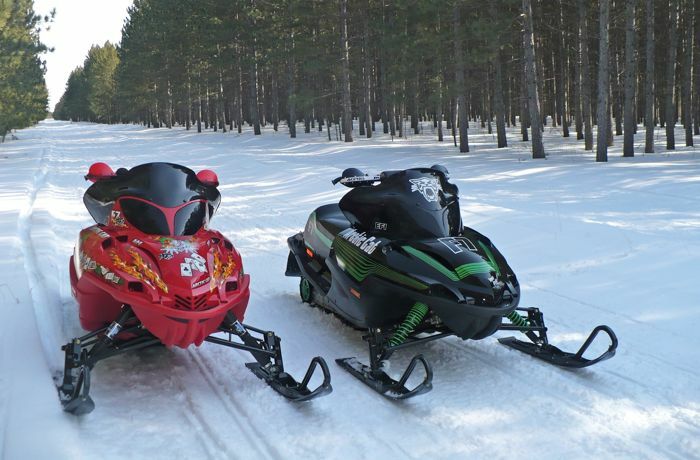 Often times during these first conversations, the topic turns to the machines we ride and own. Invariably, Cat riders seem to own A LOT of machines... to the point that I’m frequently amazed and find myself wondering just how big their garages are. 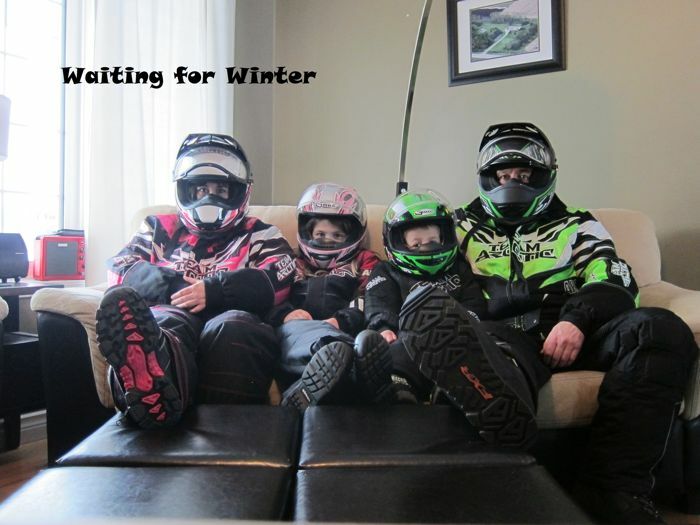 Not coincidentally, so many Cat riders have decorated their shops and garages in all-things Arctic Cat! Case in point: Darin Martens, a guy I met at Hay Days earlier this month. 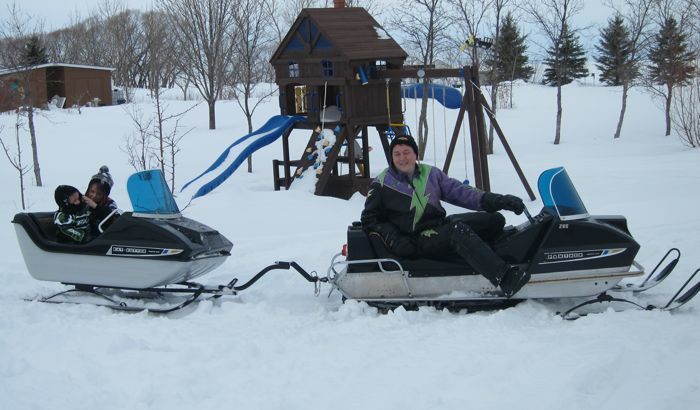 Darin is a 48-year-old Arctic Cat nut who lives in St. Francois Xavier, a town just west of Winnipeg. Darin’s been a Cat guy for 26 years. 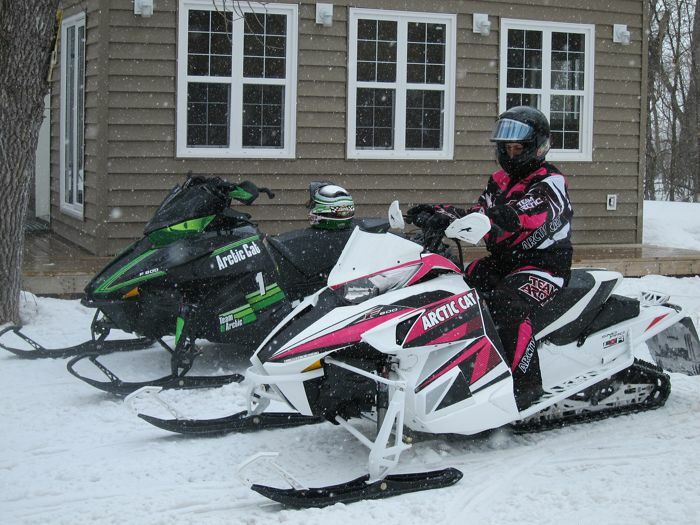 His wife Monique USED to be a Polaris rider until she fell into Darin’s orbit, and now she rides a 2013 F8000 Limited (modified with pink decals). 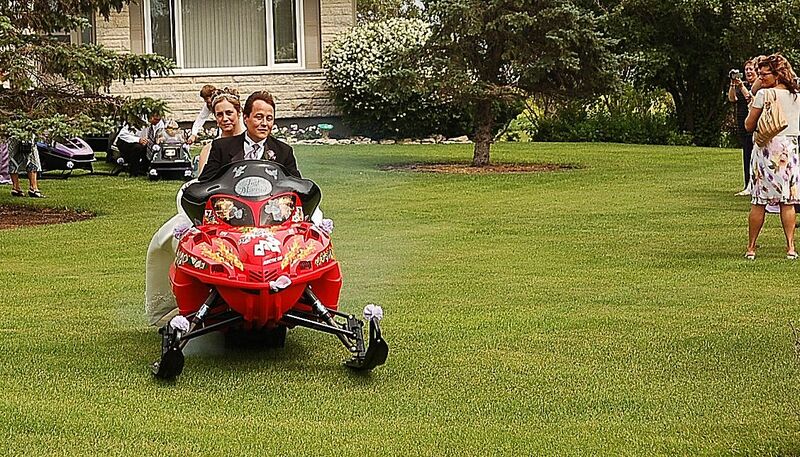 Their summer wedding in 2007 involved snowmobiles. And she even has a “CATGIRL” vanity plate on her SUV. 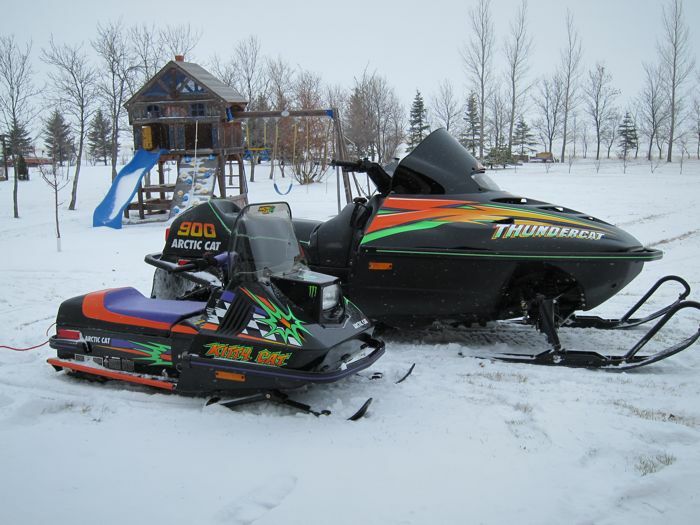 The Martens have two (Brendan and Alyssa) who currently rip around on 1972 and 1997 Kitty Cats, as well as in the Cat Cutter. 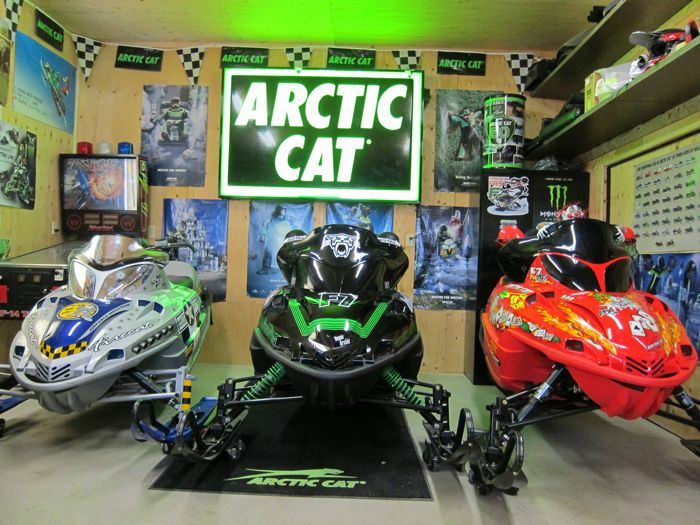 What’s more, Darin also collects Arctic Cat posters, brochures and a few collectibles. I appreciate Darin’s passion for the sport and brand, and for sharing his story with me. Thanks, Darin! 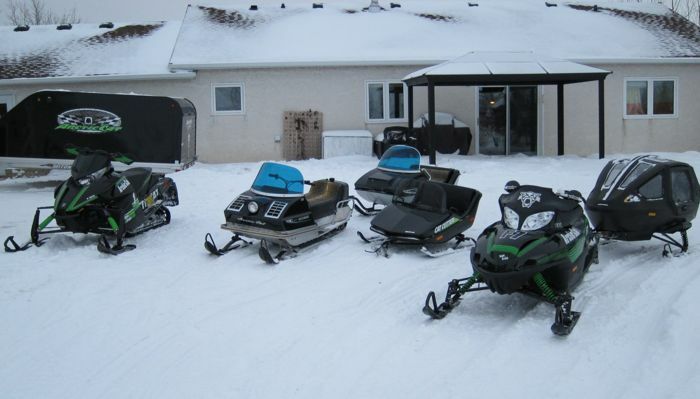 Great collection of beautiful sleds, and great story! Great story/images. 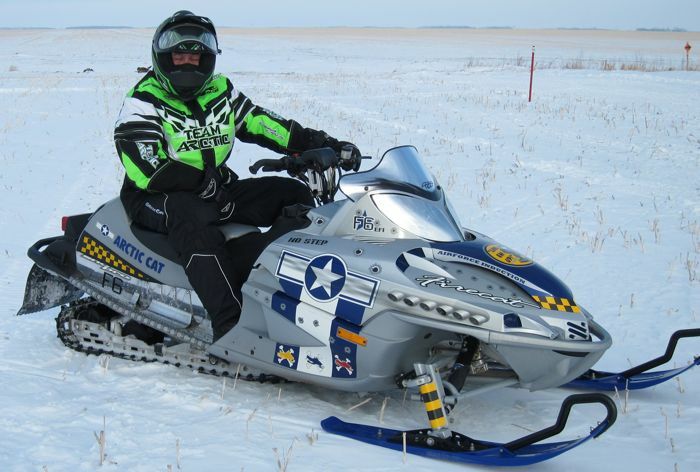 That 2004 Fighter Pilot is on my top-10 list of favorite Arctic Cat graphics ever...maybe even on my top-5 list actually. Looks like that would have been one coooool wedding! What a dream collection of toys. 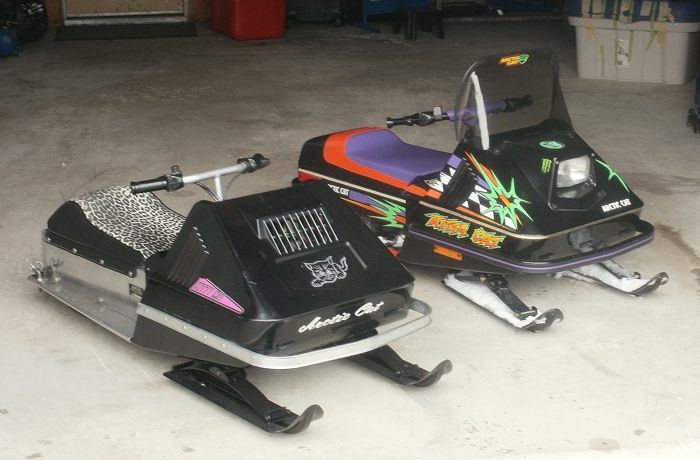 Hey Darin Nice set up you have there, still like those newer sleds of yours. Well, it won,t be long now until you can get out on them. Give me a call or drop in some time.